Since 1997, when the club started to get involved with stocking Atlantic salmon, people have been catching some of the salmon we have stocked in Fish Creek. There seems to be some confusion among anglers related to being able to distinguish Atlantic salmon from brown trout. 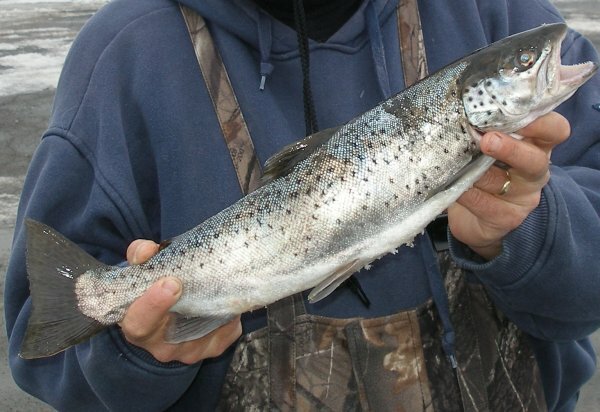 Atlantic salmon are easily identified as Atlantics by two main features. 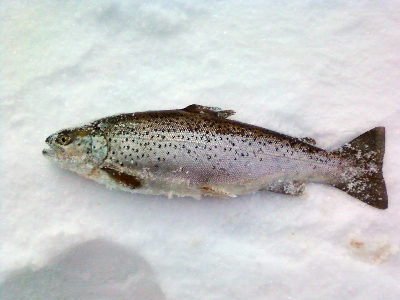 This Atlantic salmon was caught though the ice on Oneida lake in February , 2010 by 10 year old Savannah Domachowske and subsequently released back into its icy realm. It measured 20 inches and weighted an estimated 4 or 4.5 pounds. click on image for high resolution image Distinguishing features of Atlantic salmon are the short face of the fish and the length of the mouth. Atlantics have a smaller mouth than do brown trout. Notice the forked tail and the narrowing of the body just before the tail. After living in a stream for two years they become smolts, lose their parr marks and become silvery in preparation to live in a bigger body of water. This Atlantic salmon was recovered in the summer of 2001 by the Cornell Extension at Shackleton Point. Notice the shape of the fish and the narrowness of the body immediately in front of the forked tail. Also noticeable is the short nose and the small mouth. There are few spots below the lateral line. This is probably a 3 year fish that grew up in Fish Creek and came downstream to live in Oneida lake. In the past club members have heard many reports about Atlantic salmon being caught in Oneida lake by ice fishermen. This is the first one verified and photographed by the club. It measured 18 inches. A distinguishing feature of Atlantic salmon is the relatively small mouth. If you were to draw a vertical line from the rear edge of the eye it will usually pass entirely behind the mouth. By examining the inside of the mouth we can more exactly tell whether the fish is an Atlantic salmon or a brown trout. 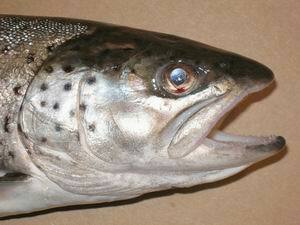 The Atlantic salmon has on the roof of its mouth a single row of vomerine teeth. The brown trout on the other hand has two rows arranged in a zig-zag fashion. In addition the tongue on the Atlantic salmon is tapered and narrow whereas the tongue of the brown trout is broad and square. In the diagram below "A" is pointing at the Vomerine head and "B" is pointing at the Vomerine shaft. As part of the smolting process the ocean-going Atlantic will be able to live in a salt water environment. The body fluids of a salt water fish has a salt concentration about 1/3 that of sea water. Water tends to flow outward to equalize the concentration of salt. Compensation is made by the marine fish by drinking sea water and not urinating. Special cells called salt cells are used to excrete salt back into the sea. In contrast a freshwater fish will produce a large dilute urine flow and will replenish lost salt by absorbing salt through the gills from fresh water. This process starts in the fresh water and continues until the fish enters the sea. The first part of the smolting process is the change coloration. The Atlantic goes through a physiological change of the kidneys, gills, intestine and hormonal system to allow body salt to be secreted back into the sea. An Atlantic salmon returning back to fresh water from the sea has to undo the changes made as a smolt in order to survive in freshwater. Not much is known about this process.